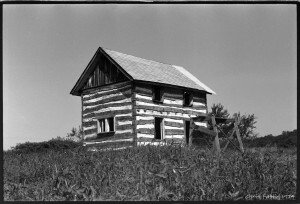 Red Dog Lodge in December 1967. 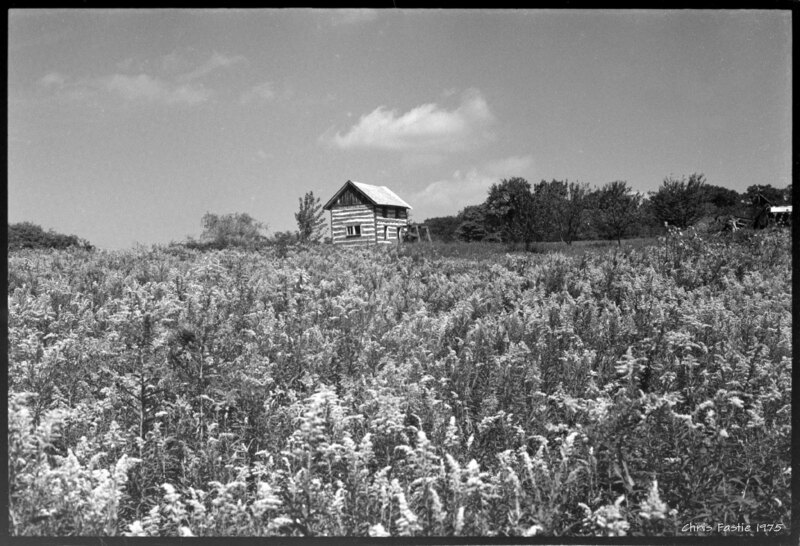 This is the crop marked on the print I bought (see below) of a photo taken by Ellis J. Malashuk, December 7, 1967. 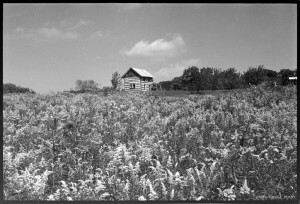 I was really pleased to learn that the archive of my own black and white negatives includes a 1973 photo of Red Dog Lodge. But last week I found a 1967 photo for sale on eBay, and it’s much better than mine. It was taken for an article that ran in the Baltimore Sunday Sun Recreation section (page 11) on December 10, 1967. I inferred that from notes and stamps on the back of the photo, and from a citation of a Paul Wilkes article “Campaign to Save Soldiers Delight” from that date. Assay office and goldenrod. Fall 1974. 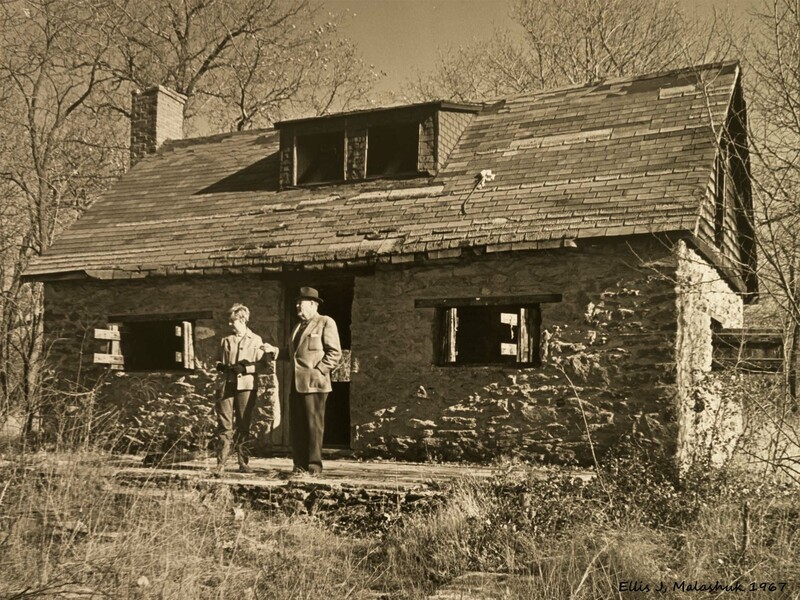 Land purchased by the State of Maryland for the Soldiers Delight Natural Environment Area included two historic buildings: Red Dog Lodge and a log cabin said to have been built in 1848. 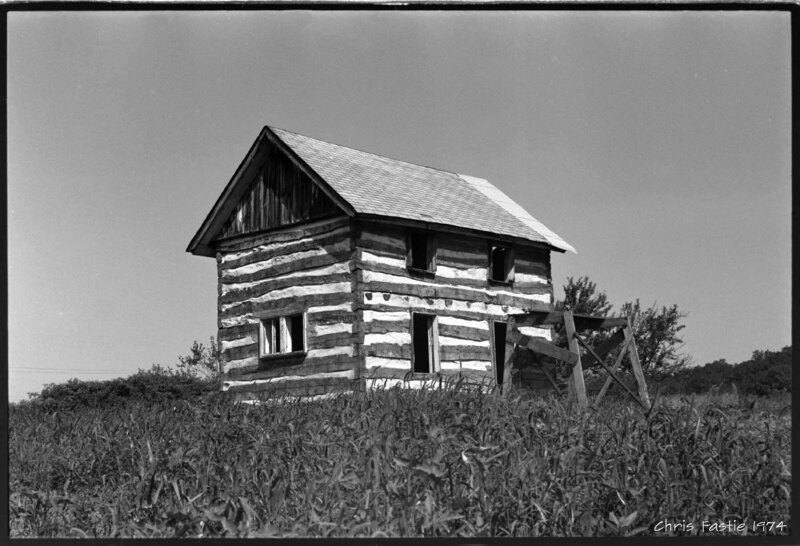 The lore is that the cabin was used as an assay office for the Tyson chromite mining operation. It was apparently well maintained for most of its decades and was well preserved when I photographed it in the fall of 1974 before much restoration had been done. There were no windows or doors, but it had a real foundation (maybe even a cellar), intact chinking, and a mostly functioning roof. Assay office and bristlegrass. There seems to be some light leakage at the top of this and other frames, I guess from worn out bulk-loaded cassettes. Fall 1974. 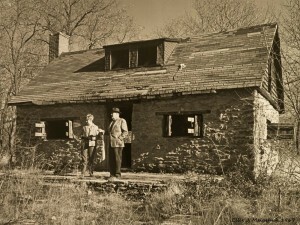 Soldiers Delight’s first ranger, E. Vernon Tracy, organized some restoration, and by the spring of 1975 the windows and doors were boarded up and it had a new roof, or at least a different roof. 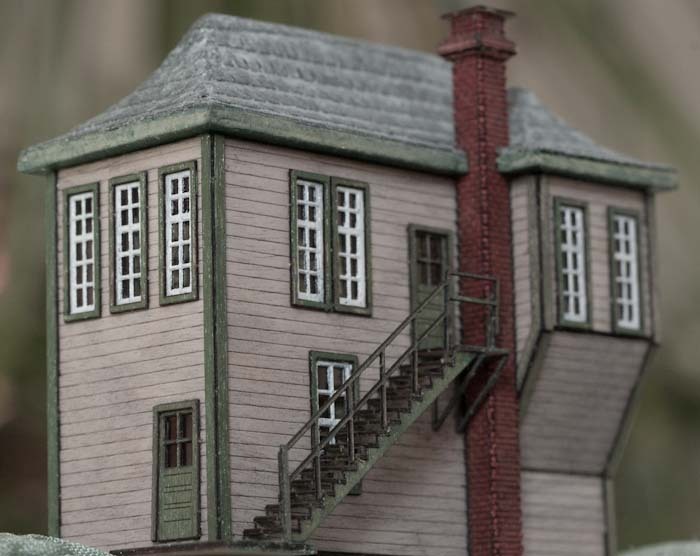 In 1974 there was a patched composition shingle roof, and in 1975 there appeared to be a wood shake roof, but not necessarily a brand new one. So I’m not sure what changed. Me in a very open field, far from arboreal things which could ruin my day. The replacement for the Fled arrived in the mail today. The Levitation Delta made by Into The Wind is not as interesting as the Fled (it is a classic triangular sail with central keel), but it is half the price and collapses to 30″ instead of 43″. And it is big — nine feet between wing tips. It does not have the stability of the Fled when the wind almost stops, but neither does it buck like the Fled, jerking forward in certain conditions. Late in the afternoon I took it up to the Bread Loaf Campus at 1400′ where I hoped there would be a breeze. It was light, but the delta flew very steadily, so I put the full autoKAP rig on flew it over toward the compound of old yellow buildings which are being prepared for Tuesday’s arrival of 250 students for the Bread Loaf School of English. The wind was variable, so the KAP rig did not stay in the same place for long and it was hard to find more than a few photos that would stitch together well. There are seven photos in the Photosynth panorama below. I am not sure what to do with the other 800. Galen’s Uncle and Aunt gave him a nice set of N scale model trains a few years ago, and we have added track and accessories since then. For his birthday in May, Galen got three building kits from GCLaser.com. 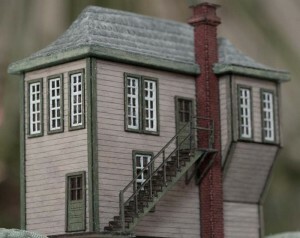 Although there are lots of HO scale plastic model kits of buildings, N scale is too small to work well for the molded plastic kits, and the available kits are 2-4 times the price of the HO kits even though they are smaller. The GCLaser kits are all wood. The pieces are precisely cut by laser from micro plywood. The material and quality control are excellent, and the parts fit together beautifully with almost no shaping or cleaning. They are more expensive than plastic HO kits, and much harder to assemble, but the results can be impressive. When I received the kits it was obvious that they weren’t quite appropriate for Galen, so I selflessly stepped up and assembled them myself. To get from here (above) to there (below), you have to have a blast. See the demolition. Click here for a GigaPan of the old bridge.